Hilton Hotels & Resorts has announced the opening of Hilton Bali Resort, situated atop a 40-meter cliff in the prestigious Nusa Dua area of Bali’s southern peninsula. The new property brings breathtaking views, extensive recreation facilities and magnificent event space to the Nusa Dua beach enclave on Bali’s southern peninsula, and joins 130 resorts across the Hilton portfolio located in some of the world’s leading destinations. 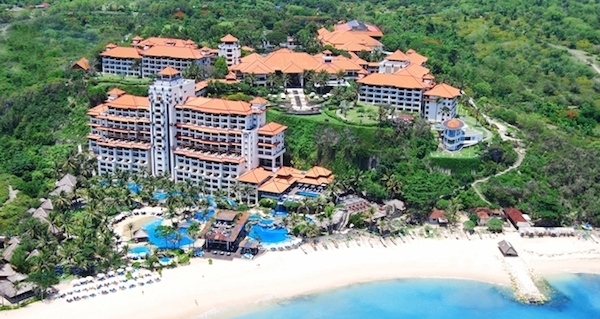 Sean Wooden, vice president, brand management, Asia Pacific, Hilton, said: “Hilton Bali Resort is a significant addition to our flagship brand portfolio, bringing Hilton Hotels & Resorts’ renowned hospitality to one of the world’s premier island destinations. The new property offers direct access to one of the most picturesque beaches on the island, and is also within 1.3km of the 18-hole Bali National Golf Course and various watersports centres. Ngurah Rai International Airport and the Kuta shopping district are also approximately 15km from the hotel via the Mandara toll road. William Costley, vice president, operations, South East Asia & India, Hilton, said the new resort was a testament to Hilton’s confidence in the resort destination and commitment to the burgeoning market of Indonesia.